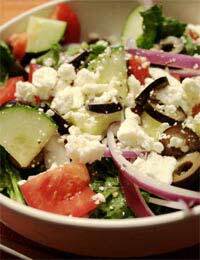 Feta is an ingredient that can be used with many kinds of salads and can really lift a salad out of the ordinary and into the extraordinary. One example of this is roasted squash salad complete with lentils and feta. This can be made in less than an hour and is healthy and delicious. First take the butternut squash, that has been cut in half, and after peeling slice it into 2cm thick lengths. Once you have completed this place the butternut squash on a tray and gently sprinkle with olive oil. Next place in an oven set at medium heat for approximately 25 minutes. Once you have done this take the butternut squash and gently sprinkle the red chilli, rosemary and garlic over it before baking for approximately another 15 minutes. By this time the chilli and garlic should be well cooked, but they should not appear brown. After you have done this use the butternut squash with some mixed salad leaves and puy lentils, generously covered with feta cheese. Another way feta can be added to a salad is by combining it with avocado and tomato. This salad will take less than half an hour to make. First take the lettuce and chop. Next take the tomato and slice into thin segments. Once you have done this you need to peel and slice the avocado before mixing everything together in a large bowl. Next take the olives, thyme and feta cheese(crumbled) and add to the salad. To make the dressing take a jar, which has a top capable of being firmly affixed, and place the salt, pepper and vinegar inside before shaking well and, once well mixed, pouring over the salad. Another variation on the feta salad theme is to combine it with roasted vegetables and couscous. First place the vegetables along with salt, pepper, garlic and olive oil in a roasting tin and roast in an oven set at 200 degrees C or gas mark 6 for approximately 45 minutes, until the edges are crispy. Next put the couscous in a large mixing bowl along with the bouillon powder and add olive oil along with boiling water. Once you have done this leave the bowl, after first covering, for approximately 20 minutes. Next cube the feta cheese and place the couscous on the serving dish before topping with the vegetables, feta cheese and basil leaves.